And why not start this blog with a celebration of The Fool, otherwise known as the Patron Saint of Fringe Artists? 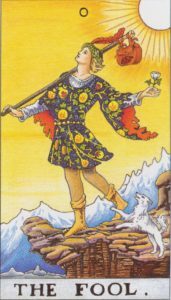 He’s the young chap in fancy garb and yellow boots on Card 0 of the Tarot Deck – with which I assume many Brighton residents are familiar. Open armed, he stands on a cliff edge, the brink of the unknown, looking upwards towards the yellow sky, full of hope, innocence and optimism. There’s little yappy dog at his feet, barking encouragement or warning – who knows? And over his shoulder a bundle on a stick, supposed to represent the life experiences he carries. All the hopes, dreams, minor triumphs and agonies that have brought us to this point and make us want to jump off the cliff – or more positively, take the leap of faith and make another show. I think it’s fair to say most people my age consider Fringe theatre a young person’s game. It’s our sons and daughters who are being waved off to Edinburgh to live on £5 a day and sleep twelve to a room. But I can testify that The Fool can strike at any time of life. Four years ago, I found myself on stage with my first attempt at a one-woman show “A touch of Mrs Robinson”, playing with a live band, to a packed room of incredulous friends, relatives and business associates, at The Pheasantry in London. I’d never been in a dressing room, or even sung many of the songs in public either (the latter frankly showed). Although preceded by months of planning and rehearsal, it was still an act of total hubris, apparently facilitated by the biological changes that take place in mid-life women, which reduce the inhibitors in the frontal cortex. I have no idea whether or not this is scientifically proven, but it’s what one of my friend’s sons told me on the night. So on this auspicious day of Fools, let’s not think of charlatans, idiots or indeed pay a second thought to the shenanigans taking place in Westminster. Let’s instead celebrate the Fools that make up the Brighton Fringe, embrace The Fool inside all of us, and maybe take our yappy dog for a nice long walk.